Since this popped into my inbox a few days ago, and the big SRAM component news dropped yesterday, I thought it might be fun to share a tidbit about SRAM. First of all, having worked in bicycle shops for 20 years, I've heard all manner of mispronunciations of this brand's name. The most common of those being "shram". Note: There is no "sh" in SRAM. But my favorite one of all time is "S-Ram". Yep! I have no idea where that came from, but I do recall hearing it from more than one person. I suppose the fact that it is actually an amalgamation of the letters from the founder's names makes the moniker an odd one for us to figure out. "SRAM" comes from the names of the founders, Scott, Ray, and Sam, with the "Ray" being the middle name of Stan Day, who just stepped down as SRAM's head honch after 31 years. So, now you know. One thing I forgot to mention yesterday about the new stuff SRAM is showing and that was regarding the electronic Reverb dropper post. They are asking $800.00 for it. Really. ya know, I get that top drawer technology has high prices, but $800.00? Nope. Not happening. Winter was melted last weekend, the trails are all icy, and so are the gravel roads. This is a tough time of year around the Cedar Valley. I usually spend a bunch of time resurrecting certain bikes that haven't gotten a lot of love in the previous riding season. Bikes like the On One Inbred single speed special. The "Limited" model, I believe. Limited to being a single speed. There are zero provisions for gears on this rig. That's fine with me, of course, and I really do like this as a mountain bike. It's old school, second generation 29"er geometry suits me fine and works perfectly around here in our tight, twisty single track. It doesn't have a very slack head tube, and the bottom bracket isn't dumped very low on it. The chain stays are longer than what is fashionable these days too. But in my opinion, things have swung too far that way. Most present day mountain bikes are not very Mid-West friendly anymore. So, the only thing I'd change here is the wheels. They are wheels like I described in a post on rims here a while back. Early-ish 29"er wheels with narrow rims. It's funny, because these are Sun-Ringle' wheels which were supposedly "All Mountain" wheels and the rims maybe are 28mm outer width. In other words, these are gravel bike wheels now! Oh yeah......all mountain. Anyone remember when that was a niche in trail bikes? Tomorrow starting at 1:30pm at Doughy Joey's in Cedar Falls, Iowa, I will be hosting the second Iowa Gravel Expo/Bike Party. along with N.Y. Roll. Last year we were focused on rank beginner gravel riders. 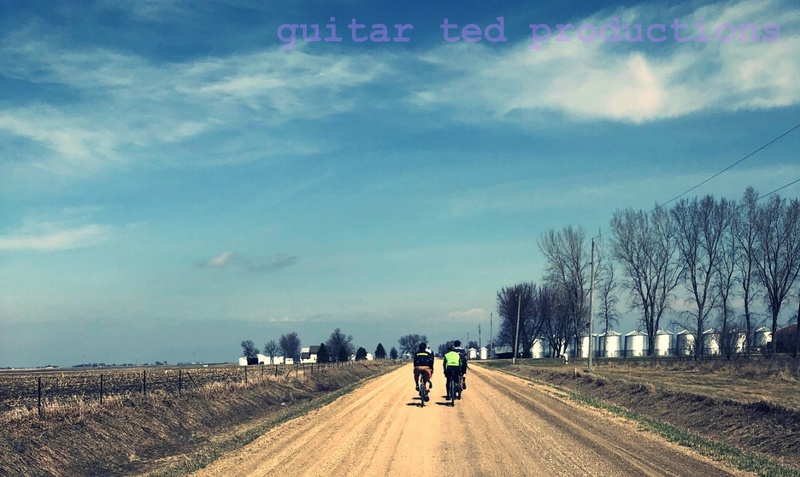 This year we are focusing on Iowa based gravel events. We have compiled a list of events and we have about 5-6 folks from various Iowa gravel events scheduled to speak at this expo. We hope that afterward folks will be enlightened as to where to go to enjoy gravel rides during the rest of 2019. Last year we had one session which ended up being standing room only. So we developed a way to split the crowd into two sessions and each can be accessed only by obtaining a guest ticket (free, no purchase required) via Tikly, an online ticketing site. The evening session can be accessed here. The afternoon session access is here. You have to choose one or the other so we can get as many people as possible. There will be free pizza provided until it runs out during each session. Attendees will be able to purchase beer and soft drinks at a bar located in the back of the upper room we will be holding forth at. There are still some spots left so don't delay and join us tomorrow at Doughy Joey's. That's it for this week. have a fantastic weekend and get out for a ride! With the up coming COG event, I have been thinking "What is mountain biking in GT land?" This whole 29er and now Gravël bike specs are blurred sharing geometry, gearing, and components. I was especially looking at rim widths the other day, and crank offset. So how does the mountain bike scene look out in GT land..... is the majority of rigs cross country style. It has been a long bit since I have cycled across Iowa, so excuse my ignorance to the terra form. The more I wonder, the more I want to decide between which rig to ride out there on. Which will be a huge commitment, as I will be stuck on that same rig for Land Run and Gravel Worlds. I hate to miss the opportunity to ride some other adventure while hoboing between events. no words startin’ with sr in the English language.